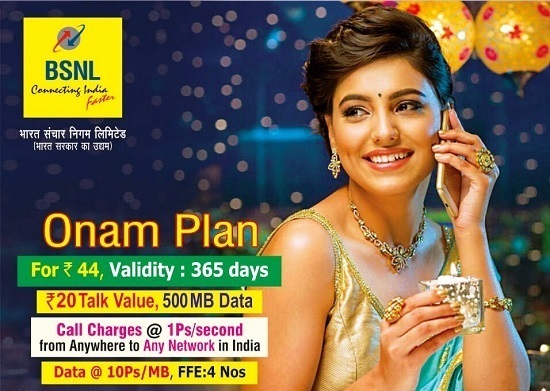 BSNL Kerala Telecom Circle has announced the launch of Onam Offers 2017 for its prepaid mobile customers with effect from 1st September 2017 on wards. As per the latest information, BSNL customers may enjoy Full Talk Time on top up denominations of Rs 20, Rs 30, Rs 55, Rs 60 & Rs 110 and Extra Talk Time on top up denominations of Rs 120 (Talk Time of Rs 130), Rs 160 (Talk Time of Rs 180) & Rs 220 (Talk Time of Rs 250). In addition, BSNL will be launching a new Combo STV 68 which offers Unlimited BSNL Calls + 1 GB Data + 68 Minutes Free Other Network calls having a validity period of 2 days. All these promotional offers are exclusively available to BSNL prepaid mobile customers of Kerala Circle for a period of 7 days from 1st September 2017 to 7th September 2017. Dear readers, please share your views and opinions about these latest BSNL Onam Offers 2017 via comments with us.